I whipped up a quick batch of this to bring to work – it was gone before I blinked. Mix sugar and syrup together in a microwave safe bowl. Microwave for 5 minutes on high. Add butter, vanilla and nuts. Stir together. Microwave on high for 90 seconds. Remove from microwave and quickly stir in baking soda. 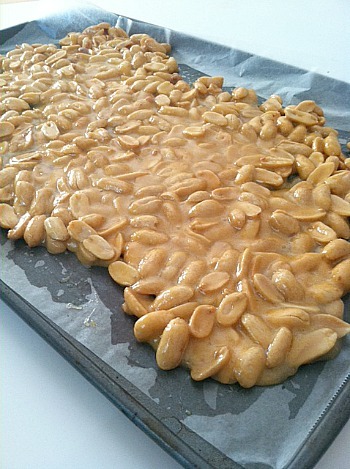 Immediately pour mixture onto parchment paper lined baking sheet (spray with cooking spray beforehand). Spread and let cool for one hour. Break into pieces. This entry was posted in dessert, nuts, QuickAndEasy, snacks. Bookmark the permalink.